Welcome to the Q&A series, a project aimed at examining food politics and the “food debate” through the eyes and minds of people involved in making and thinking about food. My questions are in bold; the interviewee’s responses are in plain text. My guest today is Diana Prichard. 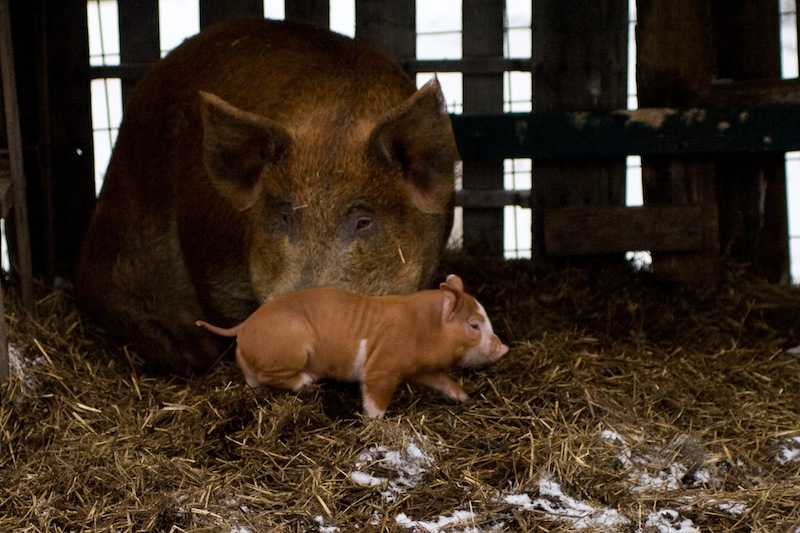 Diana Prichard owns a small farrow-to-finish hog operation and works as a freelance agriculture and food writer. Her work has been featured by outlets such as CNN, MSNBC’s iVillage, and The Huffington Post. She has traveled internationally to report on agriculture, food security, nutrition, and policy, visiting countries in Africa and the Middle East. Her forthcoming children’s book, The Cow in Patrick O’Shanahan’s Kitchen, is a riotous story aimed at engaging children and their families in fair, balanced farm-to-fork dialogue. It’s due out from Little Pickle Press, fall 2013. Diana lives and works alongside her husband and their two daughters in Michigan. She blogs at Righteousbacon.com. She can also be found on Twitter and Facebook. UPDATE: Diana wrote this piece about the history of commercial hogs for Modern Farmer magazine. A must-read! Q.: Tell us about your background and how you ended up owning a farm. A.: I’m an inadvertent farmer. I grew up just a few miles from where we are now. I was in a tiny rural village surrounded by farmers, but I wasn’t on a farm and I had no intention of getting myself onto one. I was going to move far away and do something (that my childhood self perceived to be) fancy with my life, but my now-husband and I started dating in high school. He has deep roots and I had a huge crush so we ended up staying. We decided to raise some chickens for meat for ourselves and while we were at it we offered to do the same for family and friends. The next season it was friends of friends and friends of family and it just kind of grew word-of-mouth style from there. Meanwhile I fell in love with both him and the land and the rest, as they say, is history. I’m really glad he “made me” stay here now, but I still like to use it against him sometimes so let’s keep that off the record. Q.: Why pigs? Why not, I dunno, cattle, chickens, emu, or bison? A.: We actually started with chickens and raised thousands over the first couple years. The day I couldn’t find one nice thing to say about them was the day I knew it was time to get out of the chicken business, and I haven’t really looked back. I left that branch of the farm behind with a lot of perspective and a heaping dose of respect for chicken farmers. Those birds are a lot of work for little return and they’re a special kind of dirty. Back then, when we were considering moving to larger stock, cattle were a much harder sell to my husband. He worked on dairy farms in high school and though he speaks of those experiences fondly he wasn’t in any hurry to deal with cows again. Since then we’ve had a couple of steer and we’ve found out we’re both fond of some of the beef breeds. I wouldn’t rule out the addition of a small herd of those in the future -- maybe even near -- but I’m glad we ultimately started with pigs. I enjoy them and that’s important. No one’s getting rich on a small farm. You either have to enjoy the work or go do something else. Another fact is clear: Yours is a business and you don’t have much patience with hobby farmers who want to groove on the dirt but don’t much care if they make money. So: what kind of farmer are you? Are these even fair questions or categorizations? A.: I’d argue I’m actually a pretty typical farmer. I’m passionate about feeding people in the best way I can and I think that’s something virtually all farmers have in common. Sometimes we just disagree about how to define “best way.” Sometimes our circumstances even dictate what the “best way” is and we’re left with little choice at all. But, yes, I do seem to disagree with both of the predominant farm camps more than most folks and I’d agree that the two exaggerated stereotypes you presented tend to be those most people identify. As farmers it’s our job to know our industry and make informed decisions about our operations. If a farmer can’t explain to you why a certain practice is in existence without resorting to negativity and sound bites from Food, Inc., chances are he doesn’t understand it himself. And if he doesn’t understand it himself how in the world could he have made an informed decision about whether or not he should be using it? Or worse yet about the character of the people who do? I think we can each promote our “best way” without using each other as the rungs on the ladder to the top. Fear marketing that paints other farmers in poor light is faster, but it’s not most effective in the long term. There are plenty of areas of life where I’m an instant gratification-seeking hedonist, but this isn’t one of them. As far as hobby farming goes, I have no problem with hobby farmers or their operations. I have a problem with hypocrisy. It just so happens that a whole lot of hobby farmers are guilty of being hypocrites. In my experience, these are the people who are often most vocal about big ag putting small farms out of business, and how it’s such a shame that farmers can’t make a living on their farm operations anymore. Meanwhile, they have no idea what it costs them to produce their farm products and even if they do they’re going to farmers markets and putting up roadside stands where they sell for far below cost. Big ag isn’t putting small farms out of business; consumers and other small (often hobby) farms are putting small farms out of business. Q.: I gather you’re an independent farmer. You don’t produce hogs under contract to another company. I should explain to my readers that in the second half of the twentieth century, contract farming became widespread among livestock producers (it’s been standard among produce farmers for nearly a century). Today, virtually all chicken growers and most hog farmers work as “contractors” for corporations: The farmers don’t “own” the hogs and chickens; they grow them under contract for a company such as Perdue or Tyson (the latter produces both hogs and chickens). The company tells the growers how many head to feed, what to feed them, and stipulates the conditions under which the animals are raised, right down to the ventilation system. So: contracting? Good? Bad? Depends? Not for you now but perhaps some day? A.: I’m loathe to classify a business model as inherently good or bad. I think, as with most things, it can have both pros and cons depending on the application. Farming is cash-flow intensive so it provides some semblance of risk management for the farmers who contract, which is something that most of us struggle with. We don’t contract now and I can’t see us contracting in the future, but I’m a “never say never” type so I won’t. We love farming so if it came down to contracting or going under I won’t say I wouldn’t consider it. I will, however, say that to me, supplier relationships make more sense overall. The farmer retains complete ownership and control of his or her operation, but maintains an on-going relationship with a company to supply them with products. Usually there are still production requirements -- especially for supplier relationships with national companies -- but the farmer is ultimately in control of whether or not those requirements are adopted on her farm should the company decide to make changes. Even as a farmer I’m continually amazed at how much each farm can differ from others of the same type, I think making blanket operation decisions that apply to dozens and sometimes even hundreds or thousands of farms at once is a mistake. Q.: As you know, modern hog farming, based on the use of confinement, has been attacked as inhumane, unsafe, and as a source of pollution. I gather from some of your blog posts that you have learned the hard way that 100% free range isn’t necessarily the best way to raise hogs. But I gather you don’t use 100% confinement? So tell us about how you use pasture/confinement to accommodate your livestock And what’s your take on the confinement controversy? Gestation stalls: Yes? No? Never? Someday? A.: I don’t know that I’d call it the hard way. We’ve been fortunate enough that we’ve never had bad things happen directly related to pasturing the pigs. We just learned through experience it wasn’t all it has been touted as being, and that on our farm there was a better method. But we’ve learned other lessons in much harder (and far more expensive) ways, so maybe my definition of “the hard way” is tighter than yours. These days we use a combination of grass paddocks and dirt pens. It’s hard to coin even the dirt pens as “confinement” since our tightest stocking density is still about 1/10th as dense as conventional setups, but it’s certainly more confined than pasture. Then again, even our paddocks are small compared to wide open expanses. What we’ve learned over the years is that pigs don’t get much nutrition from pasture until they’re mature, and since pigs being raised for meat never really reach maturity (they’re market size at 6-7 months old, right about the same time they hit puberty) the pasture’s main function is exercise and entertainment. Over the years we devised a system that meets their entertainment and exercise needs by keeping them in dirt pens outdoors with plenty of bedding materials and things to investigate while also preserving our pastures for better uses. Older sows who are mature enough to get some nutritional advantage out of the pastures are rotated in and out when they’re not having piglets and the ground is hard enough they won’t ruin it. For pigs who can utilize it we also provide forage as part of their diet when they’re not out getting it themselves. I think most of the controversy over all of this, including gestation crates, stems from a lack of knowledge and understanding. As you know, for generations farmers have been charged with producing abundant, inexpensive food and consumers didn’t really seem to want to know about how that was being done. Now they’re getting interested again and as they’re becoming aware of components of the system through snippets and media spin they’re appalled. How could farmers pen up sows individually? Well, sub-two dollar per pound pork chops for one. I think most farms moving away from gestation stalls is ultimately a good thing. As an industry we’re finding that while the stalls have solved some problems we were having a few decades ago, they also created some issues of their own. I think communicating to consumers why [moving away will] take some time is going to be increasingly important. Like I said, the space our pigs have is in most cases ten times as much as what hogs in conventional setups are allowed and even we have struggled with certain issues related to group housing. Sows can be mean to one another, they can hurt each other, and dominant sows will eat too much while not allowing timid sows to eat enough. Letting all sows out of their stalls tomorrow and throwing them in pens together would cause a lot of problems. Gestation stalls are not for us and we’ve never used them in the past, but I don’t fault farmers who have or do. They’ve served an important purpose in pork production over the years. Q.: Switching gears a bit: Agriculture in general. Farmers are damned if they and damned if they don’t. They’re criticized for using technologies that can lower their production costs. But they’re criticized when food prices rise. And what will happen to our food systems if the anti-science group gets its way? For example, if CAFOS and the use of antibiotics are banned, the price of meat will rise. Farmers will have to use more land (which is expensive) and livestock will have higher mortality rates. Consumers will not be happy (as I found during my research into the history of meat in America: when meat prices go up, consumers balk. ).What’s your take on all these controversies in general? Any ideas about how to make meat on a large scale (i.e., for millions of people) without science as a partner? A.: Dear heavens, no! I can’t even think of a good reason to try to devise a way to make meat on any scale without science as a partner. Science is good. It helps us keep our animals and land healthy. Science helps us make sound decisions and do things better this year than we did last. It helps us learn more from our mistakes than we could without the insight it provides. I think too many people decide science isn’t necessary because they know someone who has a flock of twenty chickens who have never been sick despite the fact they’ve never used any medications, vaccinations, or other “science”. It’s easy to underestimate how much different a flock of twenty is from a flock of twenty-thousand -- or even two-thousand, for that matter. The need for science-based protocols becomes more evident as stock numbers rise. Unfortunately, most people will never have experience with a herd or flock of the size that it becomes blatantly obvious, so it’s easy to stand back and blame the farmer for needing science when it’s really just a natural requirement due to the differences between keeping a few pets and producing animals for food. Q.: Let’s talk food politics and the “food movement.” I have to admit: the first time I saw someone refer to the “food crisis” in the U.S., I was startled. Is there a food crisis in this country? On the continuum of food activism --- conventional farmer agvocates at one end, anarchist urban gardeners on the other --- where do you stand? Does the food debate even matter to you? Or are you too busy walking the walk to have time to argue the details? A.: Good questions. The food debate definitely matters to me. My life and livelihood are dependent on it, after all. That said, having been to third world countries where people are literally starving to death I feel pretty confident in saying that no, there is not a food crisis in America. There’s a knowledge crisis, but no food crisis. As far as where I fall, I’d say it’s definitely further towards the agvocate end of the spectrum than not. Probably pretty far to that end, really. And again I think that all goes back to the philosophy I shared before. It’s my job as a farmer to understand my industry and to be able to distill it in a fair, truthful, and balanced way for consumers. I once had a very vocal food movement advocate from the other end of the spectrum ask me why I care so much about conventional farmers. I’d corrected her a few times on misinformation she was trying to spread within our group of friends and she was visibly frustrated with me. While I do care about conventional farmers -- they’re my friends and neighbors, after all -- I explained to her that caring about conventional farmers has nothing to do with it. Fear marketing and misinformation hurts us all. It undermines the legitimate arguments food advocates are making and it puts conventional farmers on the defensive. No one wins by widening rifts. Q.: It seems to me that much of the “food debate” boils down to who believes what about science. For example: GMOs. When it comes to GMOs, it’s incredibly difficult to separate fact from fiction, or to get a straight story about their use. And many food activists are hellbent on disseminating falsehoods about GMOs (the butterfly thing and the “Indian farmers are committing suicide” claim have both been soundly debunked --- and yet, food activists keep running those two anecdotes up the flagpole). But I think all of that is a symptom of a deeper issue: the politicization and fragmentation (for lack of a better word) of science. When each side of a debate claims that its version of the facts is true, then science has lost authority. That has troubling implications: Who should we believe? Anyone? No one? And if we lack a solid set of “facts,” how do we navigate the messy, complicated terrain that is our planet and our lives? If science loses all authority, we humans will have no choice but to rely on “moral codes” as the basis of decision-making, but --- that’s an even swampier morass than science. How can we make public policy if we can’t agree on the basics? Any ideas? A.: Ha! Would you like me to instill world peace while I’m at it? I’d love to say I’m scared to even imagine the day we’re relegated to using emotions and moral codes as the guidance for our decision making, but I think we’re already there -- by choice. Many of us seem to have forgotten that science isn’t about proving a particular thesis absolutely correct, it’s about proving a thesis isn’t absolutely incorrect. We eliminate the pieces of the puzzle we can prove false and proceed with the best knowledge we have at the time. Everything is a moving target; if we only operated in sure things we’d all be paralyzed. At the same time we all seem preoccupied with forcing our way and world view on everyone else. Which will never work for obvious reasons. I think if we’re going to make progress we’re going to have to start with listening, and not just the cliched kind of listening where we sit quietly and then go back to our talking points when we have a turn at the podium. Because I sit on the proverbial fence in the agriculture industry I often hear both sides making arguments that completely miss the point. How neither side sees this after all these years boggles my mind, but I guess it’s the same thing we’ve been seeing in politics for centuries. That humans are such poor communicators in general does not help. We have all these arguments that mask what we’re really trying to say and then we get upset when our opposition doesn’t understand. I could pretend to have some kind of answer to all of this, but the truth is I’m just not terribly optimistic there even is an answer. Q.: I gotta be honest: The ideas presented for “reforming” our food system strike me as extraordinarily impractical. Indeed, my greatest frustration with the “food movement” is that its advocates resolutely ignore a fundamental issue: City people don’t make their own food. They rely on farmers. And for the past two centuries, Americans have demonstrated their preference for city rather than farm. As a result, our American mode of food production (from seed to table) is designed to support an urban society; it’s designed so that a tiny minority can make food for an urban majority. The food reformers, however, argue that we should abandon “industrial” agriculture and food production in favor of smaller, local, more artisanal-like modes of production. Is it possible to feed American cities with what amounts to a retrogressive system of food production? For example, bare minimum, in order to return livestock to pasture, we’d have to raze thousands of urban structures --- malls, shops, housing developments --- and return that land to farming. And then we’d have to persuade people to move to farms. (N.B. : I’m NOT volunteering. I grew up pulling weeds.) Your thoughts? A.: Is it possible? Sure. I’m of the ‘where there’s a will there’s a way’ mindset. Is it reasonable? I certainly don’t think so. Probable? Absolutely not. As far as I’m concerned it’s not just impractical, it’s also dangerous. Dangerous for the consumers who may or may not be well fed, dangerous for the livestock who will be more likely to contract disease, dangerous for the farmers who will no longer have the advantage of “industrial” technologies to keep them safe, dangerous to the economy when money doesn’t continue to flow through the usual channels, dangerous for the future of mankind when innovation grinds to a halt because everyone is busy picking kale for their evening meal. Okay, I may have taken that last one a little too far. Listen, we have plenty of room for improvement, but throwing the baby out with the bathwater in some misguided attempt to draw a better bath is a bad idea. Fortunately, as you pointed out, a mass exodus from the cities to the farms is extremely unlikely. And pretty much impossible without some kind of government takeover and redistribution of farm land. Q.: As a citizen and a consumer, what changes would you like to see in the contemporary food system? A.: I’d like to see less fear marketing. I’d like to see fewer people who have only book smarts and no practical agriculture experience to back it up telling the masses what they should think. I’d like to see more people actively seeking information, rather than relying on labels and talking heads. I think those things would be a very good start.